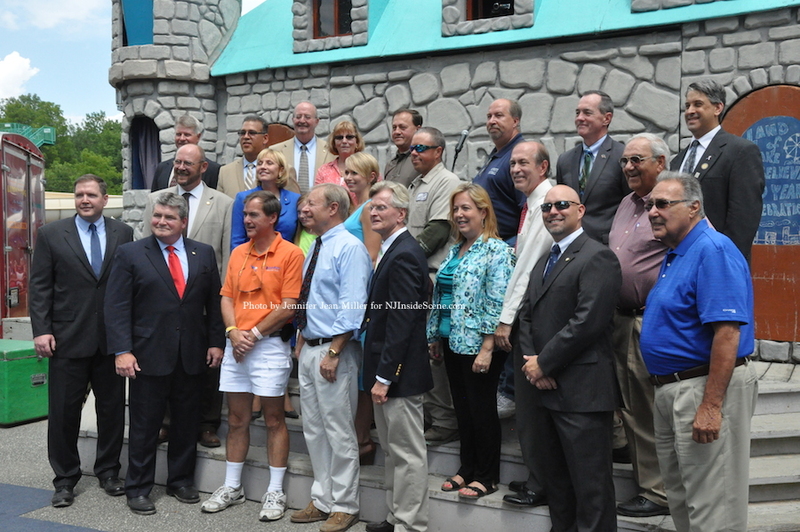 Local, county, state and national officials gathering at Land of Make Believe to celebrate the park's 60th anniversary. Photo by Jennifer Jean Miller. HOPE, NJ – On August 6, 1954 the Land of Make Believe, previously a dairy farm that Hermann and Marie Maier owned, came to life with a hayride as one of its first rides. They envisioned a place that would allow parent and child participation together. 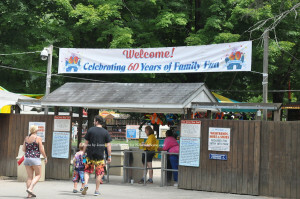 Today, the park celebrated its 60th anniversary with local, county, state, and national dignitaries. The entry to Land of Make Believe with the celebratory banner. Photo by Jennifer Jean Miller. Today, a special reception took place in the park’s center, with the current owners, Chris and Maria Maier, Hermann and Marie Maier’s son and daughter-in-law, showered with special proclamations from the many groups represented, and a congratulatory letter from Governor Chris Christie. Acting Governor Kim Guadagno with Molly McHose (left) and Cameron Ecke (right). Photo by Jennifer Jean Miller. Lieutenant Governor Kim Guadagno delivered the letter on Christie’s behalf. Today, she was Acting Governor while Christie is traveling out of the state. Under her normal duties, Guadagno is also New Jersey’s Secretary of State, a position that oversees the state’s tourism sector. Chris and Maria Maier flank Acting Governor Kim Guadagno (center) and Molly McHose (left) and Cameron Ecke (right), as they read a letter from Governor Chris Christie. Photo by Jennifer Jean Miller. Master of ceremonies for the event was Douglas Steinhardt. 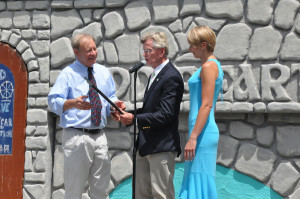 Congressman Scott Garrett (NJ-5) and Congressman Leonard Lance (NJ-7) were part of the festivities. 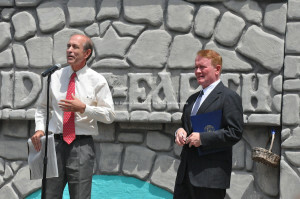 Congressmen Scott Garrett (left) and Leonard Lance (right). Photo by Jennifer Jean Miller. State Senator Steve Oroho (R-24), Assemblywoman Alison Littell McHose (R-24), Assemblyman Parker Space (R-24), Senator Mike Doherty (R-23), Assemblyman John DiMaio (R-23), Assemblyman Erik Peterson (R-23), Warren County Freeholder Director Ed Smith, Freeholder Deputy Director Rick Gardner, Freeholder Jason Sarnoski, Hope Township Mayor Tim McDonough, and President of the New Jersey Amusement Association (NJAA) William Gehlhaus, were other dignitaries in attendance. Senators and assembly members onstage. Photo by Jennifer Jean Miller. 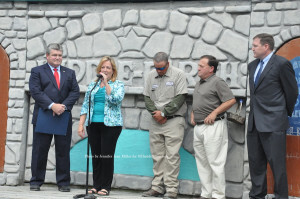 She praised the park for its effort in supporting 250 jobs. She said on the way into the park, she spoke to a 16-year-old employee named Tabitha, who was working there in her first job. 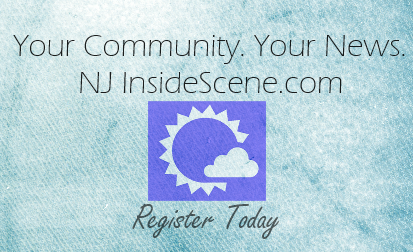 “It [working in the park] creates a sense of loyalty, work ethic, and how to manage money,” said Guadagno. Guadagno has been making her rounds in the state for her earmarked “Tourism Tuesday” days, to highlight the state’s tourism assets. Last week she was in Sussex County to focus on Swartswood State Park (click here for our story). The trip to Land of Make Believe was a special stop outside of her tour. She said this year tourism in New Jersey has increased 5.9 percent. 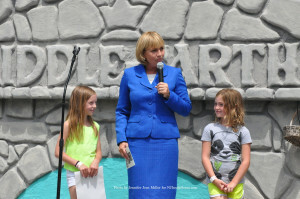 Guadagno relayed that due to Superstorm Sandy’s devastation to the shore areas, other places outside of the beach locations, such as the Land of Make Believe, helped to sustain the state’s tourism assets, and increase tourism. 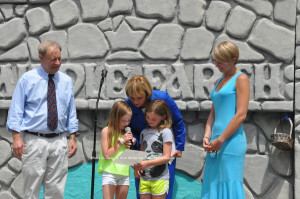 In the letter that Guadagno read from Christie, accompanied by “two of the most important people of all,” as she phrased it, two of the youngest attending the ceremony, Christie lauded the park for having served as a destination attraction, and for its sense of community and wholesome fun. Molly McHose and Cameron Ecke seated with Acting Governor Kim Guadagno. Photo by Jennifer Jean Miller. Two nine-year-old girls, Molly McHose of Franklin and Cameron Ecke of Byram, were the two who spent time with Guadagno throughout most of the ceremony and helped to read Christie’s letter. Prior to the ceremony, Guadagno also posed with the Warren County Fair Princess Gabrielle Martinez, age 10. 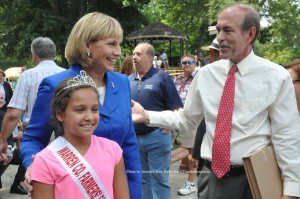 Warren County Fair Princess Gabrielle Martinez, age 10, with Acting Governor Kim Guadagno and Congressman Scott Garrett. Photo by Jennifer Jean Miller. “I commend the Land of Make Believe founders and employees for providing fun-filled entertainment for 60 years,” Guadagno, McHose and Ecke read from the letter. 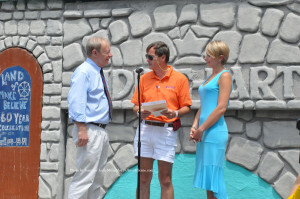 Hope Township Mayor Tim McDonough presents Chris and Maria Maier with a proclamation. Photo by Jennifer Jean Miller. Garrett said he had brought his children to the Land of Make Believe in their youth. Senate and Assembly members pose with Chris and Maria Maier after presenting their business with the proclamation. Photo by Jennifer Jean Miller. She noted how between her time in service as assemblywoman, and her father’s as senator, their time in service has likely equated to the amount of time that the Land of Make Believe has been open. Space, who owns his own family-run business, Space Farms, offered words of encouragement from one business that is a tourist destination to another. “I know they’re [Land of Make Believe] going to be here for many years to come, and congratulations,” Space said. DiMaio, who brought regards from Peterson while he was out of town described Land of Make Believe as important, if not more, than other attractions in Warren County, including Mars. Doherty and Oroho both praised the landmark for its wholesome fun, and as a place for families. Oroho presented the Maiers with a proclamation. “It’s so special to be here today,” he said. 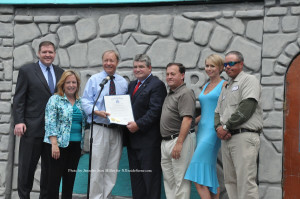 Warren County Freeholders praise the park. Photo by Jennifer Jean Miller. “A family run place will always outdo a corporate place,” said Gehlhaus. William Gehlhaus (center) of the New Jersey Amusement Association (NJAA) recognizes Chris and Maria Maier. Photo by Jennifer Jean Miller. “Thank you for coming and for your support on our special day,” said Maria Maier. Chris and Maria Maier, owners of Land of Make Believe, thank the crowd for their support. Photo by Jennifer Jean Miller. As part of the celebration year the Land of Make Believe is giving away a Ford Escape family-style vehicle and invited entries into the contest. 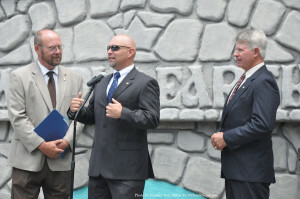 Chris Maier also recommended that attendees to the ceremony visit Pirate’s Escape, though he did not want to give away the secrets of the ride. “You’ve got to try it,” Maier concluded.